The Road Map to hell and the shem sham of shame. The U.S. should abandon the roadmap in its quest for Middle East peace, former House speaker Newt Gingrich argued in the recently published summer edition of the Middle East Quarterly. In a paper entitled, "Defeat Terror, Not Roadmap Diplomacy," the high-profile Republican leader insisted that civil negotiations and Oslo-like diplomacy should not continue until the Palestinian Authority dismantles all terrorist infrastructures. "Diplomacy is important and has a vital role to play, but its function must be different than the Oslo process and the roadmap suggest," he wrote. "The focus on Israeli-Palestinian diplomacy cannot work when one side has a leadership that does not deliver on its word." and shall set forth a multitude greater than the former, and shall certainly come after certain years with a great army and with much riches. Aholibah, secular zion, Judah, Sharon's Government soon to fall to the Dan Hassidim Chabad Lubavitch Sofiet RED Esau, who are not the seed of Abraham by faith, who are no jews, who are in fact the "gentiles" of Flesh who will run through the outer courts, and then On the Day of the Lor'd wrath these "Gentiles' will be finished and fulfilled. Do you hear in Judea? Gingrich argued that diplomacy in face of violence "is the wrong answer because it puts the wrong people in charge of finding a solution." "Diplomats, by their nature, believe in talk and in paper," he wrote. "They value meetings and agreements. But in order for diplomacy to work, negotiators must be honest brokers willing to keep commitments. Diplomacy should not be used as political checkmate while one side keeps its word, and the other side willfully disregards its promises to gain political advantage. The roadmap, developed by the Bush administration during early 2003 in cooperation with Russia, the European Union, and the United Nations, makes clear that all sides must make tangible steps towards a two-state vision. But, it was a product of a period of failure now past. It is time to move on." In a neatly outlined argument, Gingrich also urged for less Israel Defense Forces restraint and a more aggressive military response to attacks on Israeli civilians. He tries to put Israeli casualties in context of the American population and insists that the IDF response has been far more restrained than that of the US in its war on terror. "When a neighborhood shelters terrorists, it should not be surprised at a violent response,"
he insisted. "When a rocket or mortar is fired from a neighborhood, people should expect retaliatory fire. When someone advocates killing Israelis, they should expect to be killed by those they plan to kill." Gingrich also argued that the roadmap should be replaced with a "carrot and stick approach" that encourages peaceful activity for the Palestinian people. "The primary requirement for peace should be the destruction of the terrorists," he wrote. "This inherently is not a diplomatic task. Smoke and mirrors will not work." But the smoke of the abyss....will? The anti-Christ shout "Shut the anti-Shems of our Shemborg Collective up" Slay them all ! Benedict Arnold, the Sanhedrins Catholicos, yields. Jews heartened by Pope decision to review sainthood of priest By Reuters Jewish leaders told Reuters the Pope's readiness to reconsider the Dehon case at this late date raised hopes the Vatican might go slow on Pius, who many Jews say turned a blind eye to the Holocaust. "I would ask that the same kind of circumspect, thoughtful analysis that is now going to be applied to the beatification of Dehon be used in the beatification process of Pius XII," said Rabbi Gary Bretton-Granatoor, interfaith director for the Anti-Defamation League. The Vatican maintains Pius did not speak out more forcefully because he was afraid of worsening the fate of Catholics and Jews and worked behind the scenes to save Jews. While the beatification process of Pius is still at its early stages, Jewish groups have been pressing the Vatican to either freeze the sainthood process or shelve it altogether for fears that it would worsen Catholic-Jewish relations. Vatican sources said the procedure is continuing and will enter a new phase after the summer when documentation on Pius goes to a Vatican theological commission. Beatification, the first step towards sainthood in the Catholic Church, only comes after a long investigation into the candidate's life and holiness. The procedure is meant to examine all arguments for and against such an honor. "I was very heartened by )the decision to review the Dehon case( because this was not in response to a request made by the Jewish community," Bretton-Granatoor said in a telephone interview from New York. "More than anything, this demonstrates Pope Benedict's sensitivity to the Jewish community and his willingness to accommodate our concerns," he said. According to the French Catholic daily La Croix, a historian found that Dehon had denounced Jews as being "thirsty for gold" and "united in their hatred of Christ". "We hope that these revelations, if they are proven to be correct, will mean that the process will not continue," said Rabbi David Rosen, international head of inter-faith relations for the American Jewish Committee. Supporters of Dehon, who founded the Congregation of the Priests of the Sacred Heart of Jesus in 1878, apparently felt his anti-Semitic writings in the 1890s reflected widely held views at the time and were not as damning as they look now. Condo Sleezy, understanding Sharon is doomed, will work the deception, easy. Well aware of Prime Minister Ariel Sharon's mounting internal political problems, US Secretary of State Condoleezza Rice is unlikely to press him to make additional gestures to the Palestinian Authority now, senior sources in Sharon's office said Thursday night. Rice is scheduled to arrive Saturday morning for a day of talks in Ramallah with the PA leadership, and then spend Saturday night and most of Sunday in Jerusalem meeting Israeli leaders. The lack of a scheduled joint press conference with Sharon, as is usually the case when a US secretary of state visits, fueled speculation that Sharon was hesitant to share the stage with Rice because he wouldn't want to be pressed to make additional overtures to PA Chairman Mahmoud Abbas. Officials in his office denied there was any impending US pressure, saying that every trip to Israel by a secretary of state, or every trip to the US by Sharon, was accompanied by reports of imminent pressure. "The main thing of concern to Rice is to see that the disengagement plan is implemented fully, on time and in an orderly manner," one official said. "The US knows of Sharon's domestic problems and is unlikely to compound them with pressure. They want to move forward with disengagement, knowing this is the only plan that could lead into the road map." A US diplomatic official said the reason the Prime Minister's Office gave for declining the joint press conference was to spare Sharon the need to answer questions – while standing next to Rice – dealing with his precarious position in the Knesset, where he lost three no-confidence votes this week, and with declining public support for disengagement as reflected in the polls. But if Sharon was concerned about his political position, he didn't let on during a speech at the ORT Braude College of Engineering in Karmiel Thursday evening. He pledged – the same day calls were heard by some disengagement supporters in the Likud to go to early elections – that "contrary to rumors," disengagement will go ahead as planned. "The disengagement plan is not only a decision to leave Gaza, but also a decision to invest more in the development of the Negev, the Galilee and greater Jerusalem," Sharon said. "The decision is to leave a part of the land that has less security importance to strengthen those parts of the land whose strategic importance to us is well known." "I do not accept the empty claim that disengagement from Gaza is the end of Zionism. It is in fact strengthening Zionism in areas that are much more important, and that's what must be done in the Galilee," he added. Meanwhile, Israel agreed to ease up restrictions on the Palestinians, expand humanitarian assistance and open the border crossings for longer hours at a meeting between Maj.-Gen. Yosef Mishlev, the coordinator of government activities in the territories, and PA Civilian Affairs Minister Muhammad Dahlan, in Tel Aviv on Thursday night. Security officials said the two discussed a number of issues in preparation for next week's meeting between Sharon and Abbas. They agreed to expand the operating hours of the border crossings in the Gaza Strip and the West Bank. Additional permits will also be granted to Palestinians seeking medical assistance in Israel and those visiting relatives. They also agreed to work together to facilitate travel for the tens of thousands of Palestinians and tourists expected to use the Allenby Bridge over the Jordan River this summer. NEW DELHI (AFP) - The death toll from a heat wave blistering large parts of India has touched 130, officials said, as the central bank insisted forecasts of a stalled monsoon would not upset its economic growth forecast of seven percent. The death toll jumped from 65 reported a week ago to at least 130 after 39 people succumbed to the heat in the sizzling plains of northern Uttar Pradesh state, another 20 in West Bengal state and six more in Bihar, the officials said on Friday. Most of the victims in Uttar Pradesh were children, they said, adding that three populous districts ringing the Taj Mahal town of Agra, 250 kilometres (155 miles) north of the Indian capital were the hottest with temperatures soaring past 43 degrees Celsius (109.4 degrees Fahrenheit). Even hotter were parts of West Bengal state which recorded a brain-numbing 50 degrees Celsius (122 degrees Fahrenheit). "In the past week 20 people died from sunstroke in the districts of Purulia and Burdwan," Bengal's relief secretary Atunu Purokyasto said, adding the school holidays had been extended as a result. Earlier this month, at least 54 people died in eastern Orissa state where temperatures hit 49 degrees Celsius (120.2 degrees Fahrenheit) in rural areas, drying up wells and scorching paddy fields. The scorching heat also killed 11 people in western Maharashtra and southern Andhra Pradesh states where 1,400 people lost their lives in a deadly heat wave in 2003. In New Delhi, the 14 million population reeled under smothering heat for the fifth straight day Friday and temperatures of 43 degrees Celsius prompted thousands to motor down to the Himalayan foothill towns of Shimla, Nainital and Mussoori, officials said. Dozens of national leaders, bureaucrats and cabinet ministers are on official tours to Europe to beat the New Delhi scorcher. Weather department officials adding gloom said the annual monsoon rains have stalled on their northward path after sweeping southern Kerala state. The rains, which drench the subcontinent from June to September and are key to the agriculture-dependent economy, normally progress steadily north allowing farmers to sow. The central Reserve Bank of India, meanwhile, rejected worries of a slide in economic growth due to the blistering heat and said plentiful rains even if late could offset damage already done. "There is no change in monetary policy stance as such," said bank deputy chief Shyamala Gopinath, adding that the bank would not revise its projection of annual economic growth of seven percent. O' they say Jesus is the Christ, But their god is Mammon and the Dragon they worship, for they say their gods are the gods of the Jews who are no GOD and has no Only Begotten Son the Savior of Mankind the IAMHE the Creator, the WORD. The Big Quake Question: What Comes After Four? A 4.9 magnitude earthquake centered in San Bernardino County rattled a large section of Southern California on Thursday, the third significant temblor to hit the state in less than a week. While the quake did not cause major injuries or damage, it shook nerves across the region just two days after a 7.2 quake off the Northern California coast prompted a tsunami warning and four days after many residents were jolted awake by a 5.2 quake centered near Anza. Then around 11 p.m. Thursday, a quake with a preliminary magnitude of 6.4 rattled the ocean floor off Northern California, 125 miles west of Eureka. There were no immediate reports of damage or injuries. As American and Iraqi casualties on the ground mount relentlessly, President George Bush is in growing political trouble, with Republicans as well as Democrats questioning his handling of a war that has never been less popular here. In the most visible protest, the veteran Democratic congressman John Conyers organised a forum on the so-called "Downing Street Memo", the July 2002 British Government document indicating that the Bush administration had already made up its mind to invade Iraq, and that intelligence was being "fixed" to fit that policy. Six weeks after it was leaked in the British press, the memo has belatedly become a hot topic in Washington. Mr Conyers was to present a petition from more than 100 of his Democratic colleagues in the House, signed by 500,000 people, demanding that Mr Bush explain himself. The White House has haughtily brushed aside this criticism, saying the memo contains nothing new, and again dismissing charges that the intelligence process was politically manipulated. But the administration may find it more difficult to deal with bipartisan demands for an exit timetable for the 140,000 US troops in Iraq. One of the sponsors of the congressional resolution is Dennis Kucinich, the Ohio Democrat and staunch opponent of the war, who ran for the 2004 Democratic presidential nomination. More worrying for the White House, another sponsor is the North Carolina Republican Walter Jones, a strong backer of the invasion (and an author of the 2003 "freedom fries" campaign against France in Capitol Hill cafeterias). "I just feel the reason of going in for weapons of mass destruction, the ability of the Iraqis to make a nuclear weapon, that's all been proven it was never there," Mr Jones said. "I feel that we've done about as much as we can do." The day before, six more US servicemen died in Iraq, bringing the combat casualty total to at least 1,706, with 12,000 wounded. And countless thousands of Iraqis have been killed or wounded in daily suicide bombings. There is an increasingly sour mood in America, much disillusioned with Mr Bush, and inclined to share Mr Conyers' belief that "we got into a secret war we hadn't planned, and now we're in it we can't get out". In June 2002, a month before the British memo was written, 61 per cent of Americans favoured the forcible removal of Saddam Hussein, as the next stage of Mr Bush's "war on terror". Today, polls show that only 42 per cent say the war was worthwhile. Mr Bush's approval ratings have tumbled further, to just 41 per cent, the lowest level of his presidency. One reason is dissatisfaction with the economy, most notably the soaring cost of petrol. But the biggest reason is Iraq, which threatens to undermine his second-term strategy. The White House had hoped that Iraq would fade as an issue after January's elections. This, it believed, would allow it to focus on Mr Bush's domestic goals of social security and tax reform. But in the past month alone, 80 US soldiers and more than 700 Iraqis have died and the Pentagon admits that the violence is as bad as a year ago. Even some of its allies blame the White House for not telling the truth about the extent of the insurgency. "We always accentuated the positive and never prepared the public for the worst," Senator Lindsay Graham, a South Carolina Republican, said. The President's signature policy - the campaign to part-privatise social security - has hit a brick wall. "Exit Policy on Social Security is Sought," was a Washington Post headline, above a report explaining how senior Republicans were urging the White House to quietly drop the measure, since it had no hope of passing. Other Bush policies are also under attack. In a rare act of defiance, the Republican-led House voted by 238 to 187 to scrap a provision of the Patriot Act, which allows the FBI to check library and bookstore records in anti-terrorism inquiries. The President vows to veto any such change, just as he promises to "stay the course" on Iraq, and to press ahead with social security reform. But the line is growing more difficult to hold. Last night, Senate Democrats planned to block for a second time a floor vote to confirm John Bolton as the next US ambassador to the United Nations, until the White House releases more information on its embattled nominee.Other Republicans are demanding closure of the Guantanamo Bay prison, although the White House says it is vital for security. terrorising the population with public beheadings. US troops recovered the remains and withdrew to their base outside the Arab Sunni stronghold, leaving masked gunmen to erect checkpoints and carry out what residents said was the latest of many executions. A man described as an Egyptian spy was beheaded and his body dumped on a busy shopping street. Warned by the killers to leave it for five days, shoppers pretended not to notice the figure in the brown robe, its head resting on its back. Four days ago two suspected Shia militiamen were beheaded in the marketplace in full view of traders, said a senior police officer who asked not to be identified. Two boys played football with one of the heads, he added. Ramadi, 70 miles west of Baghdad, became an insurgent citadel soon after Saddam Hussein's regime fell two years ago. US and Iraqi forces claimed to have quelled it in February during Operation River Blitz, a sweep through restive towns and cities in Anbar province. Falluja, 40 miles east of Ramadi, has been largely quiet since an offensive last November pushed much of the civilian population as well as rebels out of the city. US forces tightly control movement to and from Falluja. But in other towns and cities in Anbar the guerrillas returned after the Americans withdrew and swept aside weak or non-existent Iraqi forces. Americans have been forced to mount a fresh offensive in the northern town of Tal Afar. They may soon do so in Ramadi: it was clear yesterday nobody was fully in charge. American troops guarded two bridges outside the city and every few entered the town in armoured Humvees. Each time streets emptied, leaving the convoy to patrol in near silence. Once it passed, people ventured outdoors again, including men in scarves and masks who wielded knives, assault rifles and rocket launchers. Hey, it is the price of deception, isn't it? Two cars with about 10 men set up checkpoints during the day, stopping and questioning anyone deemed suspicious. Several people were taken away, their fate unclear. Civil and tribal leaders, including Sheikh Harith al-Dari, a spokesman for Sunni Arabs, had scheduled a meeting in the main mosque to discuss political developments in Baghdad. But insurgents cancelled the meeting, saying informal contacts with American and Iraqi officials had achieved nothing. Residents said they were frightened of the insurgents but most dreaded a US-led offensive similar to that which flattened Falluja. They said the rebels were Iraqi Sunnis, not foreign Islamist radicals. The Sunni minority, privileged under Saddam, bitterly resents the US presence and the political ascendance of Shias and Kurds. An American sailor was shot dead in the city on Wednesday, hours before the five marines were killed. Witnesses said the bomb detonated at 2am yesterday just after a convoy crossed a bridge. All Humvees are now armoured but there is suspicion that insurgents have learned to make "shape charges" which narrow the force of blasts to penetrate armour. Children played with the vehicle's charred debris. Brigadier General Donald Alston, a coalition spokesman, played down the violence. "I would not consider the situation in Ramadi to be anything extraordinary at this time," he said. "We continue to put pressure on the insurgency in all parts of Iraq, including Ramadi." Residents said that in reprisal for their losses US troops fired grenades at a minibus as it crossed the bridge at 6am yesterday. Eight girls and women died and a Jordanian man was injured, said hospital staff. It was not possible to verify the account. A US military spokesman said he had heard no such reports. Elsewhere in the country, a suicide bomber killed at least eight police commandos and injured 25 when he rammed their truck in Baghdad. In the northern city of Mosul US soldiers captured Muhammad Khalaf Shakar, who they said was the most trusted lieutenant of Abu Musab al-Zarqawi, the leader of al-Qaida in Iraq. Shakar, also known as Abu Talha, reportedly wore a suicide vest 24 hours a day to avoid capture but when cornered in a hideout gave up without a fight, said US officials. Meanwhile a US army sergeant has been charged with the premeditated murder of two US officers at a military base near Tikrit. Staff Sergeant Alberto Martinez, of the 42nd infantry division, was charged over the deaths last week of two officers, Captain Phillip Esposito and Lieutenant Louis Allen. The deaths were initially attributed to a mortar blast. Boys from Africa are being murdered as human sacrif ices in London churches. They are brought into the capital to be offered up in rituals by fundamentalist Christian sects, according to a shocking report by Scotland Yard. African children being tortured and killed after being identified as "witches" by church pastors. The 10-month study was commissioned after the death of Victoria Climbié, who was starved and beaten to death after they said she was possessed by the devil. The aim of the Met study was to create an "open dialogue" with the African and Asian community in Newham and Hackney. In discussions with African community leaders, officers were told of examples of children being murdered because their parents or carers believe them to be possessed by evil spirits. Earlier-this month Sita Kisanga, 35, was convicted at the Old Bailey of torturing an eight-year-old girl from Angola she accused of being a witch. Kisanga was a member of the Combat Spirituel church in Dalston. Many such churches, supported mainly by people from West Africa, sanction aggressive forms of exorcism on those thought to be possessed. There are believed to be 300 such churches in the UK, mostly in London. Michael Jackson is heading for London soon. "Members of the workshop stated that for a spell to be powerful it required a sacrifice involving a male child unblemished by circumcision. They allege that boy children are being trafficked into the UK for this purpose." It adds: "A number of pastors maintain that God speaks through them and lets them know when someone is possessed. "It is therefore their duty to deliver the child or adult from the evil spirit. "After much debate they acknowledge that children labelled as possessed are in danger of being beaten by their families. "However, they would not accept they played a role in inciting such violence." Last month Scotland Yard revealed it had traced just two out of 300 black boys aged four to seven reported missing from London schools in a three-month period. The true figure for missing boys and girls is feared to be several thousand a year. The scale of the problem emerged through the murder inquiry following the discovery of a child's torso in the Thames in September 2001. The identity of the victim, named Adam by police, is not known but his background was traced to Nigeria. It is believed he died in a ritual sacrifice. John Azar, who helped the police on that inquiry, told Radio4's Today programme that the known cases could be "the tip of the iceberg". Police working on the Adam case have found children are being sold to traffickers on the streets of major African cities for less than £10 and then smuggled into the UK. The children arrive in London armed with false documents and accompanied by adults who believe they will bolster their asylum claims. Dr Richard Hoskins, a lecturer of Theology and Religious Studies at King's College, said: "We know this through work we have been doing on the Adam inquiry. These children are ripe for people to abuse. They are easy prey." A Met spokesman said: "We undertook a project aimed at improving our knowledge of issues impacting child abuse within the African and Asian communities of London. The aim of the project was to open a dialogue within these communities and encourage a debate which would help reduce the risks of harm to children." The report says there is a wide gulf between these communities and social services and protection agencies with many people in ethnic communities scared to speak out. The report concludes police face a "wall of silence" when dealing with such cases. Experts differ on the merits of the Scotland Yard report. Dr William Les Henry, a lecturer in sociology at Goldsmiths College, said aspects of the reports were pigeonholing crimes together and were patronising and racist. He said: "When we think about these cases we can see the same kind of patterns of behaviour in European cultures but they are interpreted in completely different ways. "This is one of the crises with social sciences anyway, when they are supposedly interpreting the folk ways or cultural habits of alien cultures." He said that the models such reports are based on are that "Africans are less civilised, less rational". But Dr Hoskins said: "This is very detailed, qualitative report that actually comes out of the communities. "This is not white people saying this. This has actually comes from the communities authored by people in the community and that really stymies the racist line." He added: "We are dealing with real cases here. When you actually talk to them, these are hard and fast facts. "So I don't think we are getting wrong, but it is right to treat it sensitively." He believes vulnerable people are being manipulated by spiritual leaders. "This is absolutely what is going on. They are often very vulnerable, poor people. "It is people in positions of power and money that are manipulating poor people." Nothing says bias like the federal government protecting against discrimination... of only one ethnic group. "It is not anti-Semitic to criticize the policies of the state of Israel." – Colin Powell. Last October the Washington Times announced George Bush's plan to establish an office in the State Department for the sole purpose of monitoring anti-Semitism around the world. Passed by both houses of Congress, the bill required tax dollars be spent solely on documenting condemnation of worldwide Jewry. Oops! We're governed by racists! Seriously, federal law should not support one group over another. The melting-pot evolution of the United States has borne thousands of different faiths, cultures, creeds and ethnicities – all supposedly equal; a policy of discrimination favoring one group is only a disservice to everyone else. As well as completely unnecessary. The State Department balked at such legislation because it already monitors a number of groups – including Jews! "We opposed creation of a separate office [...] and opposed the mandating of a separate annual report," spokesman Richard Boucher said. "We expressed the view that separate reports on different religions or ethnicities were not warranted, given that we already prepare human rights reports and religious freedom reports on 190 countries [emphasis mine]." The law is effort duplication par excellence, and I implore minority interest groups to demand equality from our representatives for all people. No assembly should get to double dip on public funds regardless of said group's awareness. For that matter, shouldn't foreign nations tackle their own intolerance issues? How will a report from the State Department effect change abroad? What a meaningless waste of time. "Anti-Semitism" is a buzzword few politicians have the backbone to educate themselves on. Most people obviously comprehend that there are bigots out there who hate people because they embrace Judaism, and I agree that religious intolerance is a tired cancer in need of retirement (not that the U.S., with its rabid anti-Islam agenda, is helping). So many other reasons exist to hate a person (my prime candidate: ignorance), why focus on something trivial like the color of their skin or their choice of god? Unfortunately, combating anti-Semitism is now politically intertwined with hatred for Israel's disastrous policies. The association is by design, as Israel has worked to blend any criticism of its goals of warmongering and genocide into contempt for all Jewish people. The resultant deflection marginalizes earnest discussion of the woes in the Middle East at the expense of the collective Jewish reputation. However, Israel does not speak for all Jews, and sweeping generalizations that brandish critics of Israel as anti-Semites are a far greater crime than a defaced cemetery or vandalized car (as many of these "hate crimes" are ultimately hoaxes). Jews are no more responsible for the actions of Israel than Catholics are for the actions of the Vatican. So why can't the United States government learn to separate the two entities from one another? Representative Tom Lantos (D-California) introduced the above-mentioned legislation because of concerns over "rising" anti-Semitism in Europe and the Middle East. News flash, Tom – people aren't antagonistic towards Judaism and Jews, they're aghast at Israel riding roughshod over world opinion without penalty. Considering the number of scandals Israel racks up, that's not unreasonable in the slightest. Israel is currently in violation of more United Nations resolutions than any other nation in the world. It continues to build a separation wall through and around Palestinian lands in disregard of international law and has essentially seized Jerusalem – a city long decided as beholden to no particular country – for its own. It also continues to develop illegal settlements in territories that do not belong to them using taxpayer money! Men, women and children are murdered by Israeli Defense Forces with little or no provocation. Amnesty International has condemned the government as complicit in war crimes; their soldiers admit to murdering Palestinians for revenge. And those are strictly domestic affairs. Internationally, Israel has perpetrated innumerable acts of espionage and sabotage upon other nations. Remember when Jonathan Pollard betrayed the United States and gave up some of its most precious military secrets? Remember when Iraq's nuclear reactor was destroyed by Ilan Ramon, "famed" Columbia astronaut? What about the Lavon Affair, where the Israeli government tried to coax the United States into a war with Egypt? How about the attack on the USS Liberty, an act of war that to this day has gone unpunished despite the pleas of the survivors for justice? And the list doesn't stop there - Israel also has a standing order to assassinate anyone they want regardless of the jurisdiction. Even now Israeli policy poisons America. The current AIPAC scandal isn't about what filtered out of the Pentagon, it's about fake information and forged documents making their way in to the Office of Special Plans – an office designed by the Bush White House to circumvent the CIA and FBI in intelligence gathering. Shock of shocks, all that propaganda built our "case" for war - a war supported by nothing but lies. Shimon Peres, Ariel Sharon's number two, has called for the ethnic cleansing (read: genocide) of Jerusalem, as he believes the city cannot exist as a viable capital for the Jewish people with 240,000 Palestinians living within its walls. Meanwhile, in the United States, when a Muslim is illegally detained and tortured in defiance of the Geneva convention, a ranking member of the House of Representatives only takes action when anti-Semitic slurs are made against said Muslim's fictitious legal counsel. Mr. Lantos, understand that people around the world are critical of Israel and its policies, not its Jewry. A multimillion-dollar survey isn't needed to figure that out – it's common sense. Your colleague Colin Powell has said it is not anti-Semitic to voice criticism of Israel. Criticizing government is one of the tenets the United States was founded upon. Doing so does not make one a bigot in any sense of the word. But you know what does? Favoring one group, race or creed over another. Congratulations, Mr. Lantos - you're a racist. Due to time limitations, we are unable to post a full update a this time. However we can say this: although the "achdus" (unity among Jews) was not perceptible, something extremely significant did occur. According to Eli, the trumpets have stopped, because they are not needed anymore: the majority of Jewish souls are now in Hashem's Heichal with the "real" Moshiach the majority of Jewish souls were elevated over Shavuos. Many are now in Hashem's Heichal with the "real" Moshiach, whom he refers to as the "holiest". (These basically seem to be those who keep Torah and Mitzvos, though not exclusively.) The majority are in the "malachim's place" (see Supernal Geography and Hashem's Heichal for details) and yet others who are outside the camp entirely, so to speak. Those who are in the "malachim's place" can be helped to be brought into Hashem's Heichal (details to follow, G-d willing), but regarding those who remain below, Eli says that he doesn't know what can be done for them. Slay them saith the Dragon? The three places mentioned in Supernal Geography have been emptied and no souls remain there. It is not clear what the future of these spiritual places is; perhaps they will be for righteous non-Jews in the time to come. Without perceiving a feeling of achdus, it is "second best" to hear that it has occurred in the spiritual realms. But the fact remains that these are serious and dramatic events occurring in the source of neshomas Yisroel, and once they occur there it is only a matter of time before they arrive in our world, G-d willing soon. For those who find "spritual developments" too vague and intangible to rely on, we suggest contacting someone with connections to a true mekubal (those living in Eretz Yisroel should be able to do so with relative ease) and you will likely be informed (in general terms) that indeed there have been big events in the supernal worlds. We have already received such confirmation of the general gist of Eli's statements. Rv:20:1: And I saw an angel come down from heaven, having the key of the bottomless pit and a great chain in his hand. Hashem is redeeming His people, and let us help every single one of our fellow Jews take their rightful place in the upcoming celebration! The trumpets are sounding and the Window is closing Rapidly, either GET aboard or Get off. Conyers’ Hearing on The Memo: This evidence is so compelling, it must be investigated- period. =10&BasicQueryText=House+Judiciary+Cmte+democrats&image1.x=0 ... the Downing Street Memo left many jaws gaping. All news organizations are now faced with a choice, are they going to continue to cover for the Bush Administration, or are they going to cover The Downing Street Memo story like it ought to be covered? Testimony was given by former Ambassador Joe Wilson, Gold Star Mother Cindy Sheehan, Constitutional Lawyer John Bonifaz, and 27yr CIA Veteran Ray McGovern. Thanks to Republican Denial, the hearing was held in a tiny room of the Capitol Basement. Despite the cramped quarters, dozens of Democratic Representatives showed up (122 signed on to Conyers’ letter), but only about 10 could make it into the room at any one time, so they came in shifts. At approximately 2:15 PM (with hearing scheduled to begin at 2:30), the Republicans scheduled 11 consecutive floor votes, lasting until approximately 4 PM. * scheduled a bunch of votes timed to intentionally disrupt the Conyers’ Hearings. If you are, RepuppetKen or Democrat, Jew or Greek it does not matter, for if you are not in Complete Faith unto the IAMHE Jesus the Christ, you shall be slain the first death and the SECOND DEATH unto eternal Damnation. They will soon make the final Move. The Hassidim are now double crossing Bushkevik, backing him against the wall. Will he soon admit that the Mossad of secular zion they wish to destroy was implicated in the WTC and pentagon Massacre, in order to caputre jerusalem and the seat and the power of Authority given them by the Dragon? WASHINGTON, June 17 (AScribe Newswire) -- On Thursday, June 16, two historic events took place in Washington, DC which shed light on the "Downing Street Memo," a secret British government memo about the Bush administration's plan to manipulate intelligence to supports its invasion of Iraq. Millions of Americans still don't know about the existence of the Downing Street memo, despite the fact that its contents are so controversial that they could provide grounds for the impeachment of the President of the United States. At 2:30 PM on Thursday, in a small room of the US Capitol, Rep. John Conyers, Jr., Ranking Member of the House Judiciary Committee, held a hearing on the Downing Street Minutes and related evidence of efforts to manipulate pre-war intelligence. Thirty-five Democratic members of Congress attended. Those testifying included Joe Wilson, Former Ambassador and WMD Expert; Ray McGovern, 27-year CIA analyst who prepared regular Presidential briefings during the Reagan administration; Cindy Sheehan, mother of fallen American soldier; and John Bonifaz, renowned constitutional lawyer and co-founder of AfterDowningStreet.org. "The recent release of the Downing Street Memo provides new and compelling evidence that the President of the United States has been actively engaged in a conspiracy to deceive and mislead the United States Congress and the American people about the basis for going to war against Iraq. If true, such conduct constitutes a High Crime under Article II, Section 4 of the United States Constitution," said John Bonifaz during his testimony in Congress today. Later in the day at Lafayette Park, in front of the White House, a rally of a thousand people was held to support Congressman Conyers as he delivered to the White House a letter addressed to President Bush and signed by over 500,000 Americans and at least 94 Congress Members. The letter asks the President to respond to questions raised by the Downing Street Minutes. Six other members of Congress attended the rally as well. I advise Congress of TREASON to Read the Noahide News, and REPENT ! while the Talmudic controlled whorish Media does not report, Chaos is spreading like fire in a trailer house. The Israeli embassy in Washington received a letter with an unknown powder in it. Washington emergency services sealed the embassy for five hours, from 5 p.m. to 10 p.m. Thursday, and kept inside about 50 staff members after a staffer opened an envelope and a small amount of powder dropped out. A threatening, anti-Semitic note said the powder was anthrax. The all-clear was given after an initial test indicated that the powder was harmless. Officials turned the matter over to the FBI, and a final result has yet to be announced. The war between the North and the South rages. Will Bush say "Secular Zion colluded with China and attacked the US and blamed it on Usama and implicated Saddam? Will this give the Chasidim Chabad Lubavitch to Give ISREALHELL to the beast Sanhedrin and the Moshiach, son of perdition? Defense Minister Shaul Mofaz said Israel has halted all it defense deals with China as it tries to work out an arrangement acceptable to the United States. Do not be deceived Bush does not control Sharon, Nor does Sharon control Bush, but the two sit at one table deceiving one another in this silent but deadly war of murders. Washington had forced Israel to cancel the sale of an early warning airborne system to China and the two countries are now at odds over the sale of Harpy drones. Mofaz denied it upgraded those drones telling the Haaretz newspaper Israel merely provided routine maintenance, under a contract signed in 1988-89. He confirmed talks with the United States to establish new mechanism for coordinating Israel's security exports. He did not say whether the new arrangement would require Israel to clear with Washington defense exports to additional states other than China. Israel's representative in the talks on the new mechanism is retired Brig. Gen. Zvi Stauber who was ambassador to Britain and now heads the Jaffee Center for Strategic Studies. Senior Democrats are calling for a full investigation into a memo that appears to accuse U.S. President George W. Bush of misleading Americans into backing the war with Iraq. Bush has always maintained that "the use of force has been and remains our last resort." But the memo, called the Downing Street Memo, could be the first documentary proof that Bush deceived the American people. During a forum organized by the U.S. House Judiciary Committee held to investigate the implications of the memo, Rep. John Conyers said the document "means that more than 1,600 brave Americans and hundreds of thousands of innocent Iraqis would have have lost their lives for a lie." "Quite frankly, the evidence that appears to be building up points to whether or not the president has deliberately misled Congress to make the most important decision a president has to make, going to war," said Rep. Charles Rangel. The memo is based on a briefing given to British Prime Minister Tony Blair and his top security advisers in July 2002, eight months before the war. Labelled "top secret," the memo summarizes a report from Richard Dearlove, the head of British intelligence, who had just met senior Bush officials in Washington. The memo says: "Military action was now seen as inevitable." That "Terrorism and WMD [weapons of mass destruction]" would be used to justify the war. But, the memo says, "the intelligence and facts were being fixed around the policy." Neither Bush nor Blair has challenged the authenticity of the Downing Street Memo. But earlier this month both said it is wrong. "The facts were not being fixed in any shape or form," said Blair. "Somebody said we had made up our mind to use military force to deal with Saddam [Hussein]," said Bush. "There is nothing further from the truth. My conversation with the prime minister was how we can do this peacefully." A separate document says Blair pressured Bush to take his case to the United Nations to give a legal justification for the war. Michael Smith, the reporter for the Sunday Times who obtained the leaked memos, said that was a brilliant case of misdirection. "The whole business about going to the UN is not to avert war, but actually to get an excuse to carry out war. And I think that's the killer document for me." At the hearing, Democrats called for a congressional investigation and some witnesses said Bush may have to be impeached. "It is a high crime to engage in a conspiracy to deceive and mislead the American people about the basis for taking the nation to war," said constitutional lawyer John Bonifaz. The U.S. media have given scant coverage to the Downing Street Memo, so it may not have much of an impact in Washington. On Thursday, White House spokesman Scott McClellan dismissed the allegation in the Downing Street Memo. He said the Democrats were "simply trying to rehash old debates that have already been addressed. And our focus is not on the past. It's on the future and working to make sure we succeed in Iraq." But what is having an impact is the surging number of American soldiers killed or wounded in Iraq. New poll numbers now show that most Americans feel the war wasn't worth fighting. Should they be stoned, hanged or decapitated, according to their own LAW? Bushkevik on his way out, did he say "Bill behold thy Mother" ? Sharon's Nephew Chabad Messianist Rabbi – Why No Disengagement? The "Messiah" (Moshiach) Told Us! Hundreds of rabbis from the so-called messianic camp of the Lubavitcher Hassidim will meet Thursday in Kfar Chabad to formulate a battle strategy against the disengagement plan, which they see as an imminent threat to the Jews of Israel. Like many other messianic Chabad rabbis, Pizam's cellphone contains the digits 770, the address of Chabad's headquarters on Eastern Parkway in Crown Heights, Brooklyn. He answers his phone with the greeting: "Long live our master [the rebbe]." According to Pizam, since the rebbe is Moshiah, no one can be more qualified than him to warn against the dangers of the disengagement plan. 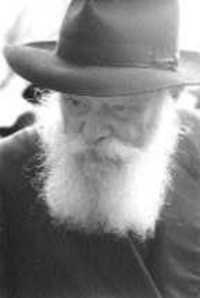 "The rebbe... said that ceding parts of the Land of Israel to gentiles endangers every single Jew," he said. "We must make this known unabashedly." Rabbi Yosef Yitzhak Wilschanski, head of the Chabad yeshiva in Safed, also said the rebbe's opinion on this matter must be made known. "We must do everything in our power to publish the rebbe's teachings on the dangers of giving up land," he said. "It is also incumbent on every one of us to disseminate the idea that the rebbe is Moshiah." More than 400 students learn in the Chabad yeshiva in Safed. What perhaps sets the more zealous Chabadniks apart from their colleagues is the belief that disseminating the idea that the rebbe is the messiah must be actively pursued. In fact, the dissemination of the idea actually speeds the coming of the messianic era, they say. So-called messianic Chabadniks believe that the rebbe, whose 11th yahrzeit is approaching, is really still alive. They admit this leap of faith cannot be rationally understood, but nevertheless adhere to it. Even Chabadniks who are not openly messianic are said to believe that the rebbe is the messiah. However, they reportedly are apprehensive that openly espousing this belief is detrimental to Chabad's primary mission – to bring secular Jews closer to authentic Judaism. Again, the Jerusalem Post's Mati Wagner has done an excellent job of accurately capturing the state of Chabad today. On Sunday evening Rabbi Yitzchok Ginsburgh of Kfar Chabad gave a shiur at the Lubavitcher shul in 770. The subject of the shiur was Matan Torah and the Chassidic outlook on Sefiras HaOmer. Rabbi Ginsburgh is currently on a lecture tour in the United States, where he will speak in Jewish communities in New York, Los Angeles and other cities.